Jessica Jones is a fictional character appearing in comic books published by Marvel Comics. The character was created by Brian Micheal Bendis and Micheal Gaydos and first appeared in Alias #1(2001). 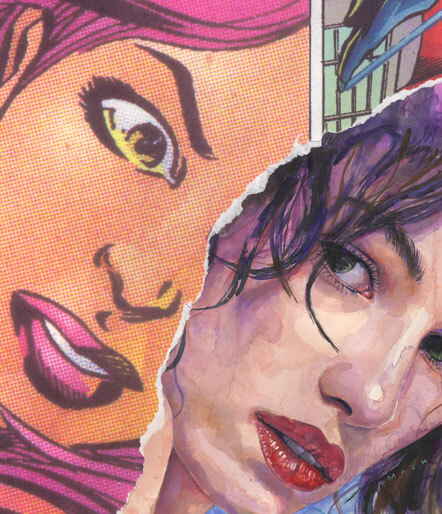 "Originally, Alias was going to star Jessica Drew, but it became something else entirely. Which is good, because had we used Jessica, it would have been off continuity and bad storytelling." Previously, Bendis commented, "I was at one time toying with doing Jessica Drew [in Alias] because she has the best hair of any superhero in comics, but this book is entirely different than what that idea was to be." By the time Bendis was actively developing the title, Jones was his central character, one with a distinct background and voice from Drew's. Jessica Jones appeared as a regular character throughout the 2010–2013 New Avengers series, from issue #1 (August 2010) through its final issue #34 (January 2013). In a Marvel Comics podcast, Bendis expressed his desire to incorporate Jones into the parallel universe Ultimate Marvel imprint. In Ultimate Spider-Man #106, she appears as a senior at Peter Parker's school. Jessica Jones was a lonely Midtown High School student with a crush on fellow student Peter Parker (who would soon become the hero Spider-Man) and a fantasy fixation on the Human Torch. She was on a trip to Disney World with her family when her father, distracted by the backseat quarrel of her and her brother, lost control of their car in an accident with an army truck transporting unidentified experimental material, possibly radioactive, to which Jessica was exposed in the course of the accident. Her father, mother, and brother were killed, and Jessica sustained injuries that put her in a coma for months. While the Fantastic Four clashed with Galactus outside her hospital window, Jessica awoke from her coma; she was placed in a home for wayward children and later adopted by a family named Jones, whose name she took. Months after the accident, while running home from school in an emotionally distraught state, Jessica manifested superhuman powers as a result of the experimental material to which she had been exposed; her inexperienced flying led her to crash-land in the bay, where she was rescued by Thor. She soon realized that she had also gained superhuman strength. While testing her flight capabilities, she chanced upon and defeated the costumed criminal known as the Scorpion, in desperate straits not long after his first defeat by Spider-Man. Proclaimed a hero, Jessica soon took on the costumed identity of Jewel, beginning her heroic career less than three years after Spider-Man's debut. Little is known of Jessica's career as Jewel, but her activities were evidently not as high-profile as those of many of New York's other costumed heroes. Nevertheless, she remained active for around four years, befriending a handful of other heroes, until she came upon a riot provoked by the Purple Man. Using his pheromone powers to take control of her, the Purple Man directed her to attack the approaching police, then held her in his thrall for months, subjecting her to physical and mental humiliation in imagined retaliation for his defeats by other super heroes. Finally, in a fit of insane rage, he sent Jessica to Avengers Mansion hoping she would find and kill his nemesis, Daredevil. Jessica attacked the first hero she saw, the Scarlet Witch, an act that snapped her out of the Purple Man's control. Unprepared to explain her actions, she fled and was pursued by the Avengers, taking a powerful blow from the Vision. Ms. Marvel rescued her from further attack, but Jessica was rendered comatose and cared for in a S.H.I.E.L.D. facility until Phoenix of the X-Men telepathically helped her regain her faculties. After weeks of physical rehabilitation, she was offered the position of S.H.I.E.L.D. liaison to the Avengers, but Jessica felt that her experience had taught her that she was unsuited to the life of a costumed hero, and she gave up her Jewel identity. Moreover, she found that the Purple Man's mistreatment had left her emotionally unsure of herself, particularly in romantic endeavors. Details of Jessica's subsequent life are sparse, although it is known that she was involved in a string of relationships that ended badly, including one with S.H.I.E.L.D. agent Clay Quartermain. She also became close friends with Ms. Marvel, who would undergo her own share of trauma during her Avengers membership and afterward. At one point Jessica attempted to return to costumed action as the Knightress, but this period was brief. She eventually became a licensed private investigator and opened her own firm, Alias Investigations. Jessica's recent string of cases included a surveillance assignment involving a woman whose companion was revealed to be Captain America, who changed from his then-secret identity into costume before Jessica's video camera; when the woman whom he had been photographed with was slain, Jessica realized she had been set up. She was questioned by suspicious police officers but helped out of her predicament by the timely arrival of attorney Matt Murdock. Her investigation led to a fight with enforcer Man-Mountain Marko and the revelation that she had been expected to publicize the video with the intent of creating a scandal defaming Captain America and the US government. With the help of S.H.I.E.L.D., Jessica exposed the plot's mastermind, a man named Zoumas, and received the thanks of Captain America, who encouraged her to return to the heroic life. Jessica next investigated a deranged man claiming to be Avengers associate Rick Jones, who paranoically feared attack by the alien races in whose war the real Jones had intervened. Jessica managed to partially calm his madness and reunited him with his wife. She was then hired by J. Jonah Jameson in an effort to track Spider-Man, only to bilk the publisher by spending his money on charitable endeavors. An out-of-town case led her to help troubled teen Rebecca Cross, who had run away after encouraging people to believe she was a mutant out of rebellion against her town's oppressive atmosphere, but the case ended badly when Rebecca's aunt killed her unjustly accused father. When Daredevil's secret identity as Matt Murdock was exposed, Murdock hired Jessica and the hero-for-hire Luke Cage as bodyguards. This initially proved awkward as Jessica and Cage had had a brief fling which strained their friendship, but they soon resolved their difficulties. Jessica instead began dating Scott Lang, the Avenger known as Ant-Man, with whom she was set up by her friend Carol Danvers, formerly Ms. Marvel and now Warbird. She next found herself investigating the Mutant Growth Hormone trade, and teamed up with fellow superhuman investigator and ex-costumed heroine Jessica Drew to rescue Mattie Franklin, the young heroine formerly known as Spider-Woman, from being misused by the dealers. She also hired the dedicated but annoying young Malcolm Powder as a part-time assistant. When the Kingpin sent the insane assassin Typhoid Mary against Murdock, Jessica and Cage worked together against her, getting her on the ropes so that Murdock could deliver a blow to end the fight. Jessica's greatest challenge came when relatives of some of the Purple Man's victims asked her to confront the imprisoned villain about his many murders, several of them committed on whims, in hopes that he would give their families a sense of closure by confessing to his killings. She was greatly apprehensive about confronting her former tormentor, but being consoled by Cage, she agreed to visit the Purple Man in prison, only to receive no useful information from the psychopathic mind-controller. 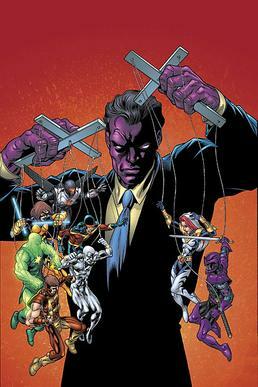 The Purple Man then escaped in the chaos caused by the breakout of fellow prisoner Carnage, and he sought out Jessica in order to again control her. When the Avengers arrived, he commanded Jessica to fight them, but she activated a psychic defense trigger left in her mind by Phoenix years earlier and defied him, knocking him out with one blow. In the aftermath of the confrontation, Jessica informed Ant-Man that she was pregnant with another man's child and the couple broke up. She instead moved in with Cage, the father, and the two began a long-term relationship. Jessica has since taken a position as a superhuman consultant with the Daily Bugle, working with reporter Ben Urich on stories related to New York's growing super hero population. After their daughter was born, Jessica and Luke were married in the company of their heroic friends. After coming into contact with experimental chemicals and spending some time in a coma, Jessica emerged with superhuman abilities. She possesses superhuman strength, as well as flight, and is known to block mind control because of her strength. She shows the capacity to lift a two-ton police car with little apparent effort. Her strength allowed her to lift up a giant-sized Goliath by the nostrils and toss him a short distance, break Atlas's nose, and render her fellow superheroine Jessica Drew unconscious with a single punch to the face. She later withstood being punched by a human on Mutant Growth Hormone and suffered only mild bruising and a bloody nose, and was able to recover in moments after being shocked by Jessica Drew's venom blasts. Despite this resistance to harm, Jessica suffered severe injuries, including a damaged spine and neck, a detached retina, and a broken nose after being attacked by both the Vision and Iron Man. Jessica is also able to fly, and while she was able to fly quite well during her early years as a heroine, she has admitted that her flying ability degenerated while she was no longer an active hero. 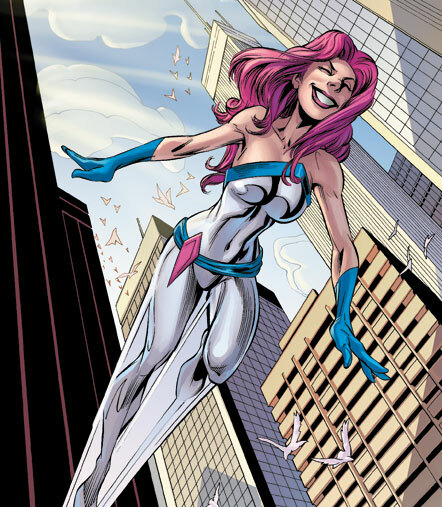 She has since displayed improved flying ability after joining the New Avengers. After her ordeal at the hands of the Purple Man, Jessica was given a degree of psionic protection by Jean Grey of the X-Men. This psionic protection was sufficient to protect Jessica against a second attack by the Purple Man, though she had to "trigger" this resistance on her own. 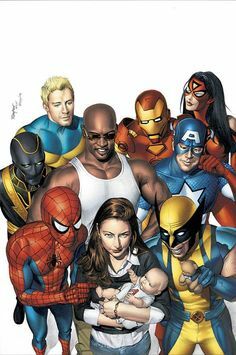 Jessica Jones has a number of allies including Luke Cage, Daredevil Spider-man, Ant-man, Iron man, Iron Fist, Captain America, Wolverine and many more. Jessica Jones has a number of enemies including the Purple man, Chemistro, Doctor Octopus, Rhino, Victoria Hand, Norman Osborn and many more. Jessica Jones is a Netflix exclusive series which is tied to Daredevil and is a part of the Marvel Cinematic Universe. It features Krysten Ritter as Jessica Jones, David Tennant as Purple Man, Rachel taylor as Patsy Walker, Mike Colter as Luke Cage and Eka Darville as Micheal Ducasse. The show received good reviews by both fans and critics.